It's not uncommon to have elements of your job wind up following you home...maybe some pens from the office, a cupcake from the bakery, or a limited-edition craft brew bottle from the bar (or maybe two.) But recently, a whole new level of work-treasure was unearthed (unmooned?) 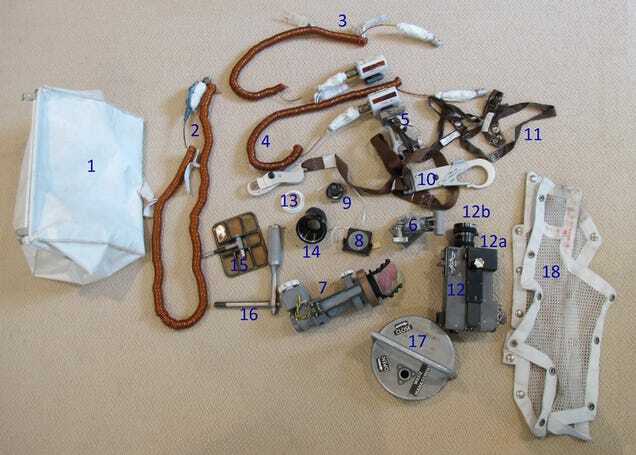 when Neil Armstrong's widow discovered a cache of original Apollo 11 equipment...stowed in a bag at the back of a closet. "Time to conquer the moon. But first, a selfie." 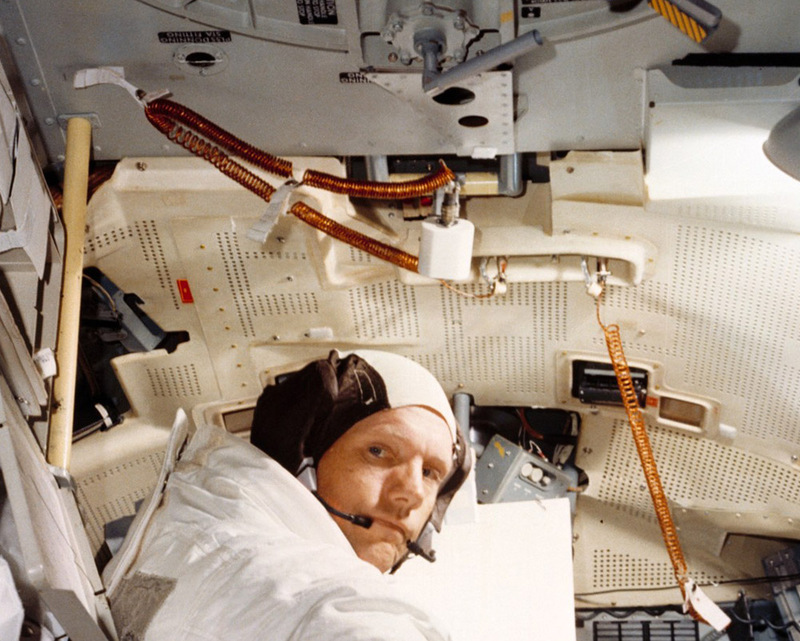 Armstrong, pictured near some of the power cables found in his moon-stash. As reported by gizmodo.com, the amazing and historically rich find had been either forgotten or kept a secret by Armstrong, who died in 2012. His wife Carol reported the find to Alan Needell, the curator of the Apollo collection at the Smithsonian Air And Space Museum, and it was instantly recognized to be of "priceless historical value", according to NASA. 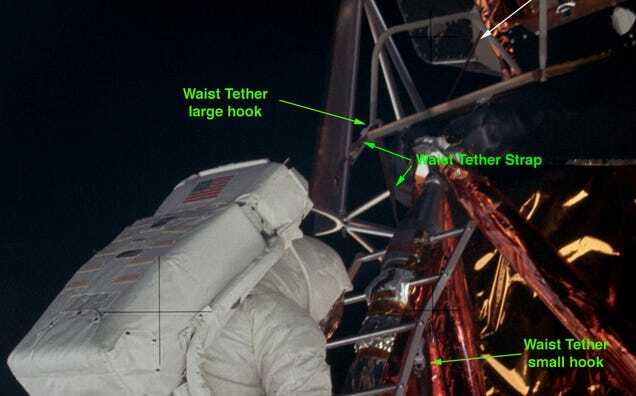 Known as the "McDivitt Purse", the bag was a readily-available container kept accessible inside the lunar Eagle module, where it was used to keep small parts from floating away in micro-gravity. "The Purse" was named for Apollo 9 commander Jim McDivitt, who had emphasized the importance of a stowable bag for for the front of the spacecraft. The one-of-a-kind collection is now being prepared for display by the Smithsonian. Allen Wrench? Maybe on Earth. Offplanet, that's the door key to a moonship! Inside, all manner of Apollo artifacts had been preserved by Armstrong. Power cables, hand tools, a valve cover, a mounting bracket, and other everyday-type items were in the collection, but the crown jewel of the space stuff was a 16-mm film camera (plus accessories!) 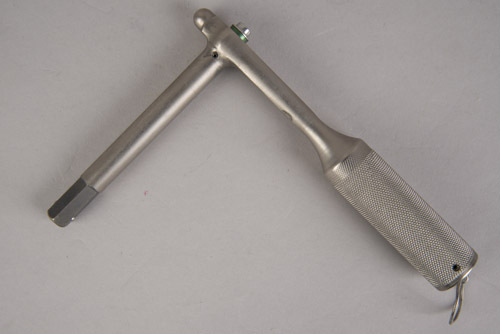 that was used to record the descent of the Eagle onto the surface of the moon. The original Apollo 11 footage (left) as compared to footage from the modern unmanned LRO (Lunar Reconnaissance Orbiter.) Because moon movies are always awesome. Also present was a safety strap that was photographed in use for Buzz Aldrin's EVA ("Extravehicular Activity"...a common term for astronauts, which in this case specifically meant WALKING ON THE FREAKING MOON.) You know...so he wouldn't get too excited in that 1/6th gravity and just bounce away. Buzz Aldrin, rocking the waist tether on descent from the Eagle. Just moon things. By the way, if you swoon for some moon, you can check out the LRO's sharp, zoomable moon imagery right here. Thanks to NASA, more info on the overall LRO project, which is run from the Goddard Spaceflight Center in Maryland, can be found here. Take your own lunar recon voyage from the comfort of Earth! Sure, it may just be an orbiting chunk of rock that's mostly comprised of what Buzz Aldrin called "magnificent desolation"...but it's OUR chunk of orbiting rock. And in an age where we can use a smartphone (that contains more computing power than the Eagle had) to check out close-up snaps of a celestial body, it's cool to recall that even some small steps like helmet straps, power cables, and bits of hardware were critical to making that "giant leap for mankind" come to pass.